The natural mission of Computational Science is to tackle all sorts of human problems and to work out intelligent automata aimed at alleviating the b- den of working out suitable tools for solving complex problems. For this reason ComputationalScience,thoughoriginatingfromtheneedtosolvethemostch- lenging problems in science and engineering (computational science is the key player in the ?ght to gain fundamental advances in astronomy, biology, che- stry, environmental science, physics and several other scienti?c and engineering disciplines) is increasingly turning its attention to all ?elds of human activity. In all activities, in fact, intensive computation, information handling, kn- ledge synthesis, the use of ad-hoc devices, etc. increasingly need to be exploited and coordinated regardless of the location of both the users and the (various and heterogeneous) computing platforms. As a result the key to understanding the explosive growth of this discipline lies in two adjectives that more and more appropriately refer to Computational Science and its applications: interoperable and ubiquitous. 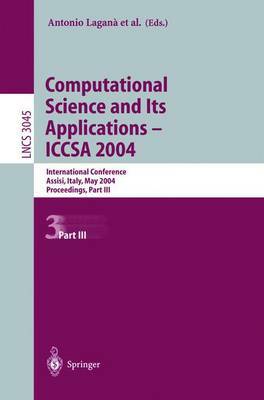 Numerous examples of ubiquitous and interoperable tools and applicationsaregiveninthepresentfourLNCSvolumescontainingthecontri- tions delivered at the 2004 International Conference on Computational Science and its Applications (ICCSA 2004) held in Assisi, Italy, May 14-17, 2004.